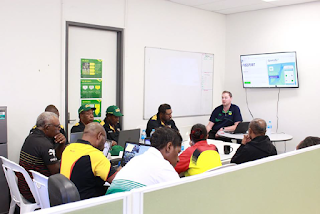 The Australian NRL recently ran a one-day training, introducing LeagueNet to PNGRFL - Papua New Guinea Rugby Football League sports administrators. LeagueNet is the official national database of the NRL, and provides an integrated online system for all Clubs to offer registration and manage competitions and is designed to manage administrators at all levels. This collaboration boosts the cooperation between Australian NRL and PNGRFL to further strengthen administrative capacity of the national rugby league body. PNGRFL CEO Reatau Rau said such a workshop was vital in paving the way for better management of club and player records in the confederates. “The workshop is an eye-opener for the participants who will now have the task of going out to collect data and update records online,” Mr Rau said. The Australian High Commission is committed to partner with PNGRFL to provide such capacity building and institutional linkages between organisations.